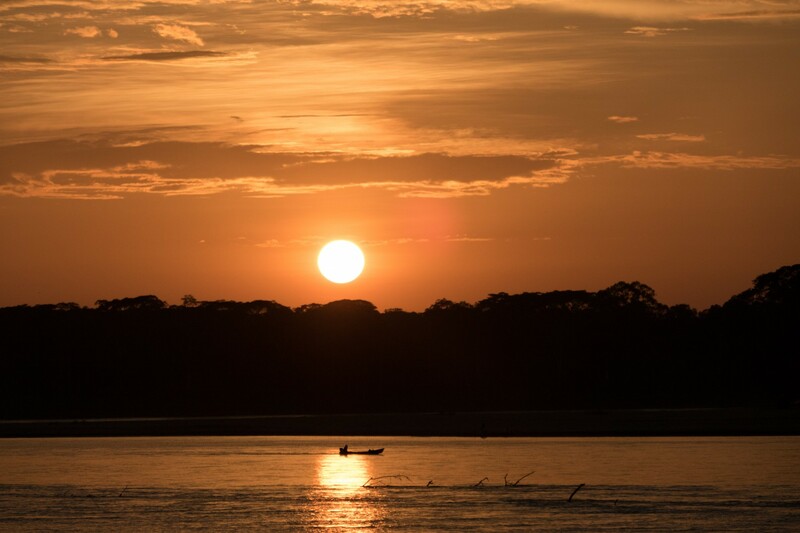 A group of NCI-Ecuador staff members recently made a trip to the Amazon to explore new conservation opportunities and meet with potential partners in the northeastern province of Sucumbios. 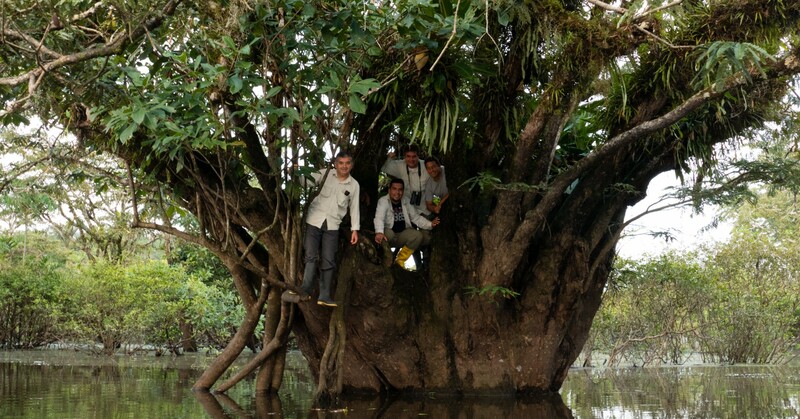 Our main objective was to familiarize ourselves with Sucumbios’ ecosystems and investigate the possibility of upgrading protection for a number of areas currently designated as “Protected Forests” – a weak category of protection. We are interested in working with municipalities to create municipal reserves, particularly in areas that would connect existing protected areas. 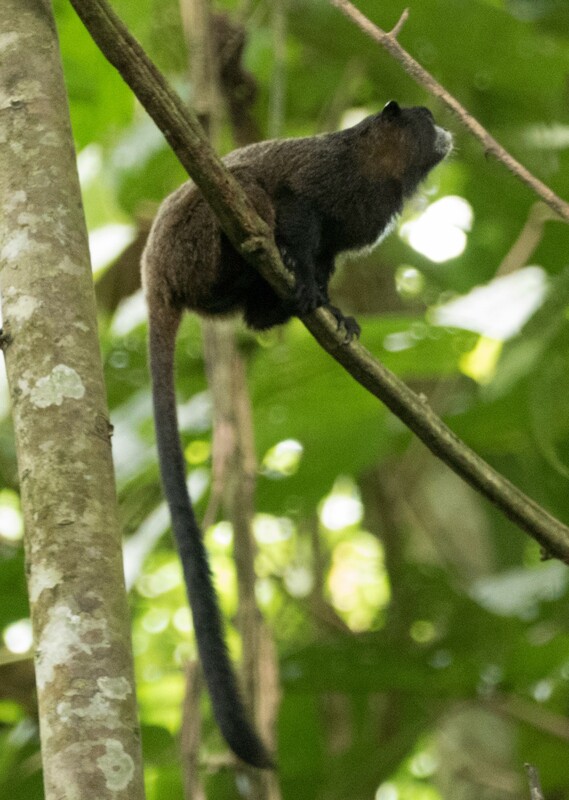 For example, the Pañacocha Protected Forest is located between the Cuyabeno Wildlife Reserve (described in detail below) and Yasuní National Park. Together, Cuyabeno and Yasuní total almost 4 millions acres of some of the most biodiverse habitat on the planet. On Tuesday, February 16, we started paddling down the Cuyabeno River in three canoes with our indigenous Siona and Kichwa guides. The Cuyabeno River threads through the Cuyabeno Wildlife Reserve. At just over 1.4 million acres, it’s the second largest of Ecuador’s national protected areas (right behind Yasuní). 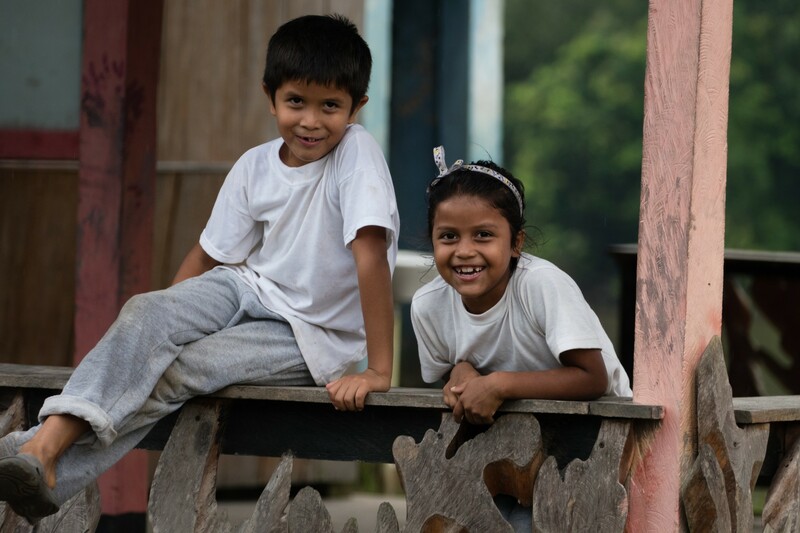 It is home to many Siona and Kichwa communities – two of Ecuador’s thirteen indigenous nationalities. The river at the launch site is slightly wider than a two-lane highway, overhanging with vegetation and with occasional snags in the water. 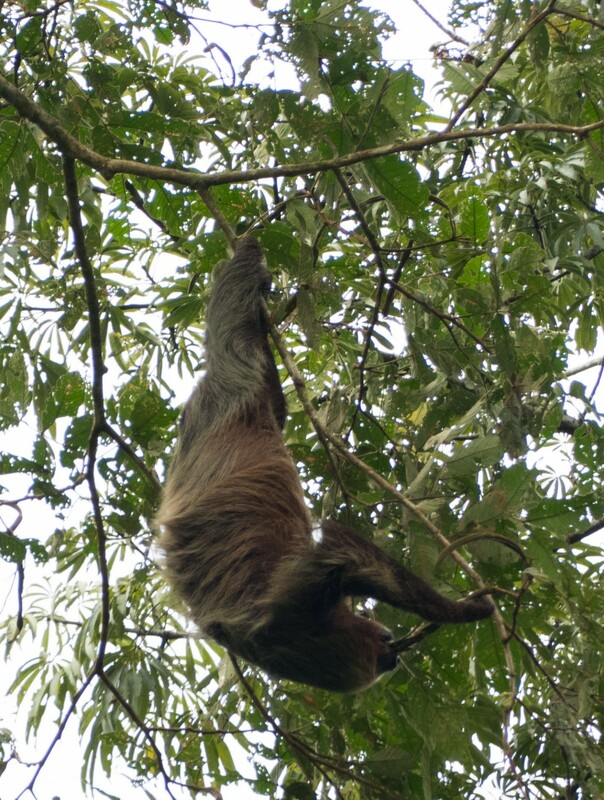 We saw a sloth and a Saki monkey almost immediately, which got us into the spirit of the afternoon. At about 5 p.m., we reached our campsite, enjoyed a quick swim in the river (and were warned of stinging manta rays if we ventured too far), then another brief paddle down river to enjoy an oropendula nesting colony in a cecropia tree. Their pendent woven nests and gurgling displays are quintessential sights in the trees along the river, as are the macaws that fly across the sky in pairs, announcing themselves raucously long before you see them. That evening, we went on a nocturnal insect walk, seeing large crickets, katydids, whip-scorpions, a wolf spider, and my particular favorite, a Saturniid moth (a great example of mimicry where the “owl eyes” on the moth’s wings make potential predators think twice about eating it). 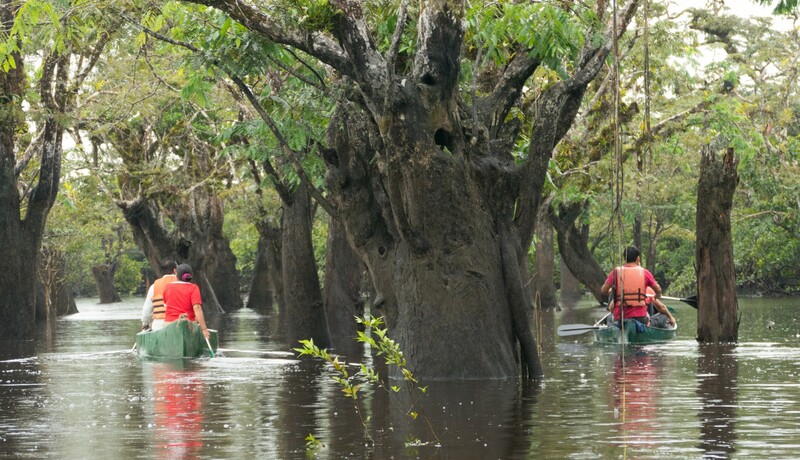 The next morning, we loaded our canoes into a motorized boat and jetted down river – startling two spectacled owls as we passed – to Cuyabeno’s prime tourist attraction, a series of seasonally flooded interconnected lakes. We spent the morning paddling among the trees, enjoying the many raptors, herons, ibises and hoatzins (disheveled prehistoric-looking birds that ferment vegetation in their crops and whose rank-smelling flesh protects them from poaching). Stopping for a break, we saw a mixed troop of spider and capuchin monkeys as well as surfacing river dolphins (though I can’t in good faith claim that I saw more than bubbles on the water). Then a canoe race, which Bruno and Augusto won only through the worst kind of under-handed skullduggery, swerving at the last minute and causing a two-canoe pile-up that denied rightful victory to Renzo and me. And finally down to lunch at the Magic River Lodge. Cuyabeno is a tourist destination, primarily for European and North American tourists, though our night at the Magic River Lodge was shared with about 40 Ecuadorian college students studying tourism administration. We watched a gorgeous sunset in the largest of the lakes with six other motorboats zipping around us, which must have been stressful for the wildlife as it certainly made the experience less tranquil for me. Still, it was an amazing site with dusk falling among the back-lit trees. As we made our way back to the lodge in the dusk, we shined our flashlights along the banks. 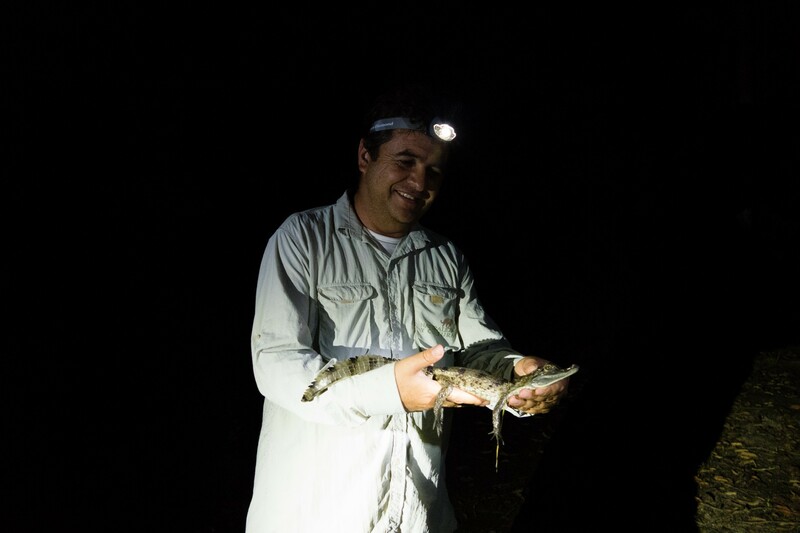 Red eyes of caimans glowed back at us. I’m glad I didn’t see them before swimming on the first day. We didn’t sleep much that night at the lodge, our fellow guests, the Ecuadorian tourism majors, being like most college students, nocturnal and gregarious. The next morning, we jetted back up river, passing a number of hawks, toucans and aracaris (small toucanets) to return to the same point where we launched two days’ prior. From there, we drove north to the town of Puerto el Carmen (government center of Putumayo County) on the Putumayo River, which is the boundary between Ecuador and Colombia. 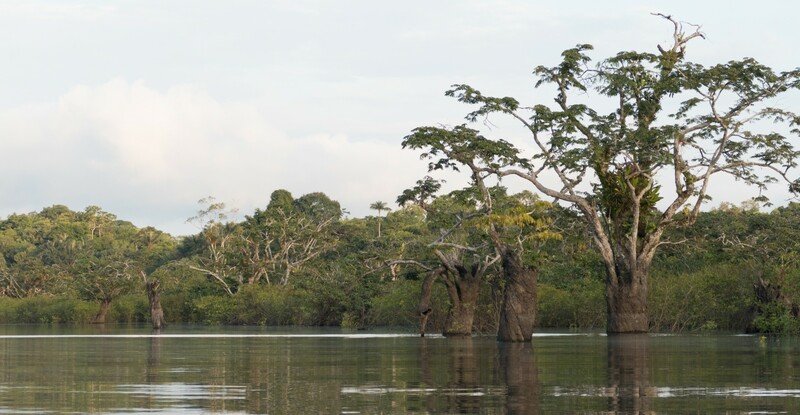 We took a two-hour boat ride up the river with the Municipal Government of Putumayo, paying particular attention to the health of the riverine forest on the left bank (Ecuador’s side) where there is a potential opportunity to create a 250,000 acre municipal reserve called Cuembí. The forest looks in good shape. There are a number of small Siona, Kichwa, and mestizo communities along the riverbanks. I enjoyed watching life on the river, such as people washing clothes, shoveling sand, bailing out canoes, and hauling goods up and down river. The communities don’t extend far beyond the riverbanks, hence the majority of the forest is intact. The next morning we met with Putumayo’s municipal staff to discuss potential next steps toward creating the Cuembí Municipal Reserve, and heard about their interest in establishing a tri-national protected area with neighboring Colombia and Perú, another possible project for NCI’s support. We then drove back to Lago Agrio, paralleling a roadside oil pipeline the entire way. Sucumbios is one of Ecuador’s oil-producing provinces with infrastructure that dots the landscape. In Lago Agrio, we visited La Perla Municipal Park where we saw squirrel and titi monkeys and Snail and Hooked-billed Kites. Augusto and Jaime drove to Puyo, and Renzo, Bruno and I flew back to Quito and the next morning to Loja. Staring now at my computer screen, I realize how these natural areas nourish my spirit. I need them. I am proud that NCI will play a part in protecting these wondrous places and others like them.